Plants yellowish green, up to ca. 20 cm tall, varying in shape from narrowly linear-lanceolate to irregularly ovate with marginal lappets and a double dentation; consistently lax. 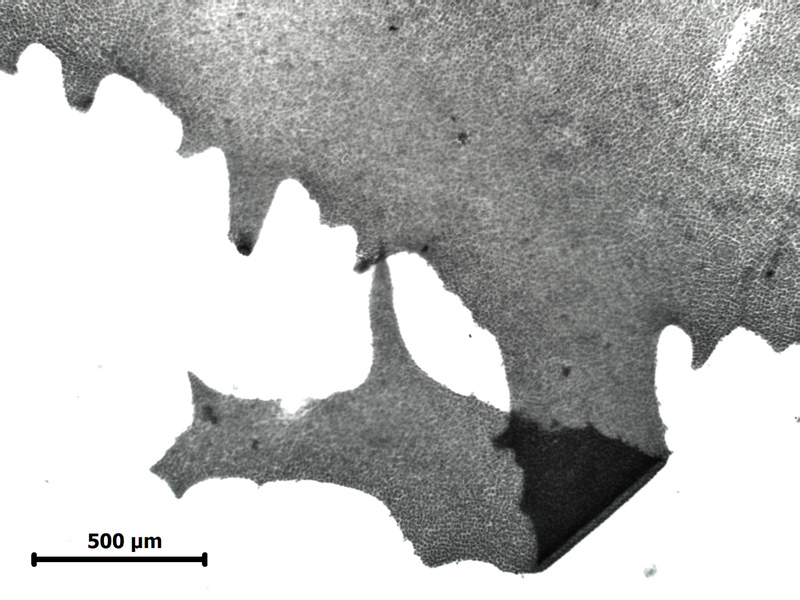 Cells in surface view without much order, rounded angular, 8-16 µm in diameter, increasing to 25 µm in the basal region.Thickness of (distromatic) lamina from ca. 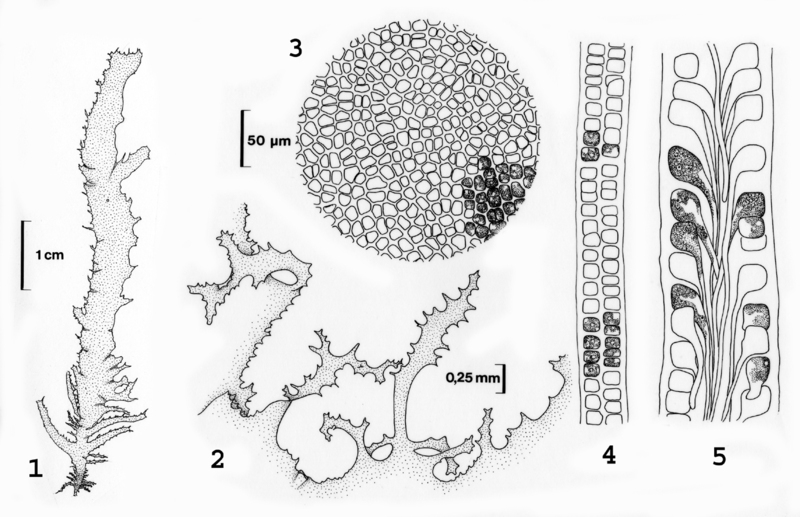 45 µm in the apical region to 80 µm in the mid-thallus and 120 µm in the upper basal region. Cell height 15-35 µm , 1-2 times higher than broad, much rounded on the outer periclinal wall. 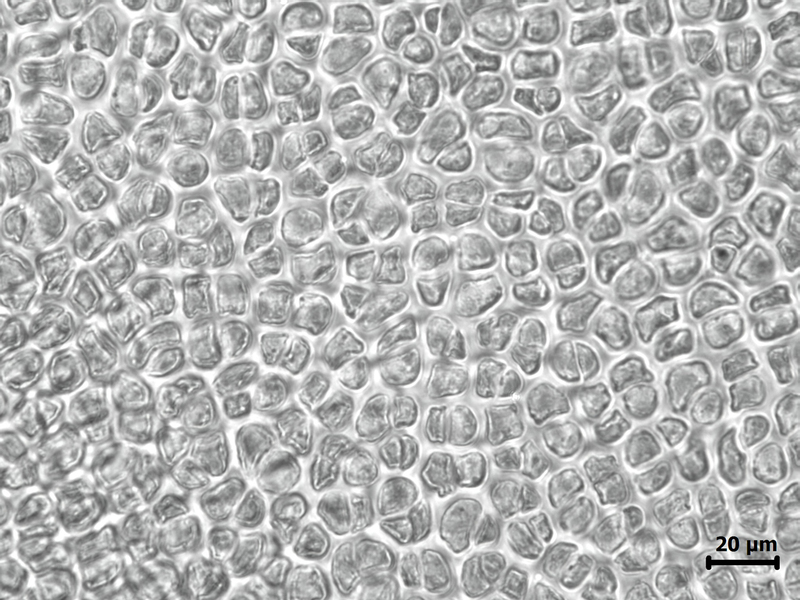 Chloroplast parietal, its position in the cell variable, generally with one pyrenoid but in the larger cells of the basal region often with 2 or 3 pyrenoids. Rhizoidal cells larger than the other vegetative cells; rhizoids not united in bundles. Description from Stegenga et al., (1997). Recorded from False Bay to Morgan Bay (17-43). Found in high intertidal pools; often epiphytic. World distribution: also recorded from Namibia and Portugal (Guiry & Guiry 2012). Type locality: Port Alfred, South Africa (Silva et al. 1996). 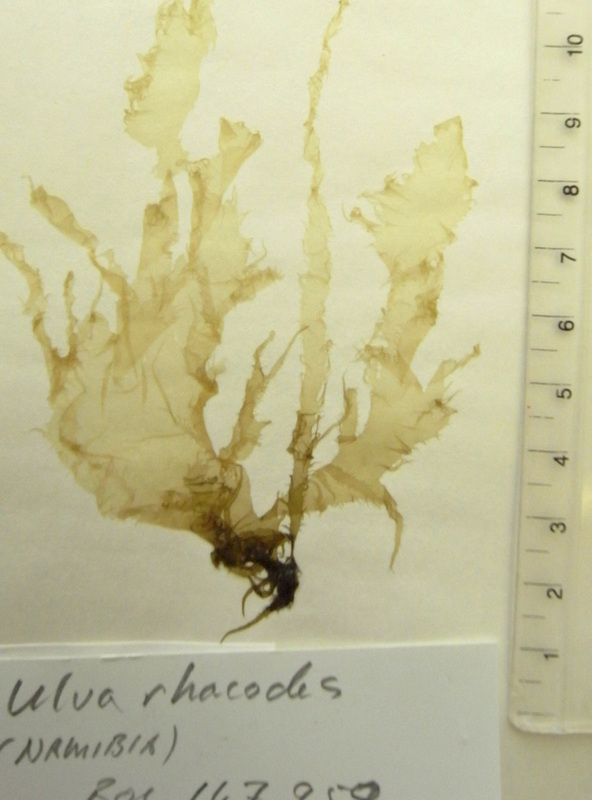 Ulva rhacodes, herbarium specimen from Namibia (BOL). Ulva rhacodes, herbarium specimen showing small marginal teeth. Ulva rhacodes, herbarium specimen showing surface view of cells (BOL). Ulva rhacodes. 1, Habit of young plant. 2, Thallus margin in detail. 3, Surface view showing cell arrangement, 4, Section of middle thallus. 5, Longitudinal section of basal thallus. Reproduced from Stegenga et al. (1997). Guiry, M.D. & Guiry, G.M. 2012. AlgaeBase. World-wide electronic publication, National University of Ireland, Galway. http://www.algaebase.org; searched October 2012. Papenfuss, G.F. (1960). On the genera of the Ulvales and the status of the order. Journal of the Linnean Society of London, Botany 56: 303-318, 21 figs, 6 pls. Stegenga, H., Bolton, J.J. and R. J. Anderson. 1997. Seaweeds of the South African west coast. Contributions from the Bolus Herbarium 18: 655 pp.